Context: Schizophrenia affects 1%–1.5% of the population of the world. The illness commonly affects young population disturbing and disrupting the patient as well as his family. Research has demonstrated increased physical and mental health morbidities among these caretakers. Aims: The aim of this study was to explore various stresses and social problems faced by caretakers due to patient's schizophrenia. Settings and Design: A qualitative study of the distress experienced by primary caretaker of schizophrenia patients was undertaken at a tertiary hospital in an urban Indian setting. Methods: Relatives of 30 patients were assessed for their physical, psychological, and social problems. Their narratives of distress caused by patients' illness were recorded as verbatim and analyzed qualitatively manually. Statistical Analysis: Manual qualitative and quantitative analysis. Results: Caretaker was a parent in 72.3% of the cases. Distress due to blaming by relatives for not bringing up the child carefully was reportedly experienced by most parents, especially the mothers. Local cultural setting plays a huge influence in these highly personal and sensitive concerns. Social stigma, anxiety about illness, anger, and resentment were commonly reported. Conclusions: These insights into suffering of the caretakers of people suffering from schizophrenia in current local setting need to be considered and addressed as essential part of the management of Schizophrenia. Schizophrenia is a severe, chronic, disabling, and psychiatric disorder which requires a constant medical as well as social support system. It can be a particularly disabling disease because of its chronic and relapsing course. It has lasting impact on the entire family. There are various inherent challenges in the management of distress of schizophrenia patients' relatives. The practical, financial, and psychological burden on patients' families leads to loss of productivity and compromised quality of life. There is also often need for psychosocial and economic support. It also takes a toll on the mental, physical, personal, and professional life of the caregiver leading to changes in routine activities, work, and social relations of the caregiver. Apart from these shame, guilt, and embarrassment, the blame reinforced by the close family members is difficult to bear with. This subjective burden caused by distress due to these is more important as we are now emphasizing on the community-based care and rehabilitation of the schizophrenia patients. While many research studies have been done on burden on caregivers, there is a gap in the information that we have about the self-reports of distress faced by the families. Perceived distress and needs of relatives are important in planning management of chronic illness like schizophrenia as they are often instrumental in causing various psychological problems such as depression and anxiety in the caregivers.,,,, Overall perceived impact of illness on the caregiver as a person and his routine functioning was the focus of this study. Recent Indian study, on this topic has emphasized on the need to enhance quality of life of caregivers of schizophrenia. In clinical practice, we often see relatives and friends disrespecting the caretaker, evoking emotions of anger and shame in them, which may spiral into depression and other psychosomatic disorders. Exploration of sources of distress in unstructured way was thus undertaken in the present study. The instruments derived from qualitative interviews of the caregivers are important in addressing the needs of caregivers but are not readily available for the local setting. This study is one step toward developing such instrument and obtaining the database. The aim was to explore various stresses and psychosocial problems faced by caretakers of patients with schizophrenia. This was a tertiary hospital-based, cross-sectional study of a selection of patients with schizophrenia with the inpatients and outpatients of the Department of Psychiatry. Patients accompanied by primary caretakers and willing for participation in the study were interviewed. Such consecutive patients reporting to outpatient departments and inpatient departments during the study period were included in the study. Permission of Institutional Ethics Committee was obtained for undertaking the study. Thirty consenting first-degree relatives, of patients with schizophrenia, were interviewed based on a semi-structured questionnaire designed with reference to available literature. Responses were recorded verbatim and analyzed qualitatively and quantitatively. First-degree relatives of patients diagnosed to have schizophrenia were interviewed. Interview was carried out in a room to ensure privacy and ease of answering the questions. All the admitted patients' relatives, who consented to participate after giving them information, were included in the study. Data collection was done over a period of 3 months. Thirty such relatives were administered the semi-structured questionnaire prepared for the study. It was prepared using review of existing literature, considering likely problems and appropriateness in the Indian setting. Two of the authors conducted interview at a time. One of them asked questions and the other one recorded the responses in writing in the prepared format. The semi-structured questionnaire included basic sociodemographic information of the relative and the index patient and brief information about the illness. The main part was the questionnaire to assess the relatives perceived practical, social, and emotional difficulties in everyday life. Their diagnosed physical and mental illnesses were also recorded. They were asked about their own mental health problems as well. Most of the caregivers were elderly people (parents: 72.3%). About 50% of the relatives perceived being blamed by others for the patients' illness. Others included their family members, in-laws, neighbors, and friends. The reason for the illness was more commonly attributed to pampering the patient as a child, excessive anger toward the patient, or parental neglect. Nearly 40% of the people had superstitious beliefs and resorted to unscientific means to be cured. 60% of the families suffered a financial crisis. 93.33% of the relatives have associated various illnesses ranging from headaches to depression. Very few perceived receiving any support from their family or friends, in cash or in morale, and for most of them, the doctors and social workers were their only pillars of support. 33.33% of the relatives expressed their frustration about having to care for their grown up ward with this illness. Physical illness was documented as per history and psychiatric illness was diagnosed clinically by the treating psychiatrist using the International Classification of Diseases-10 diagnostic criteria. 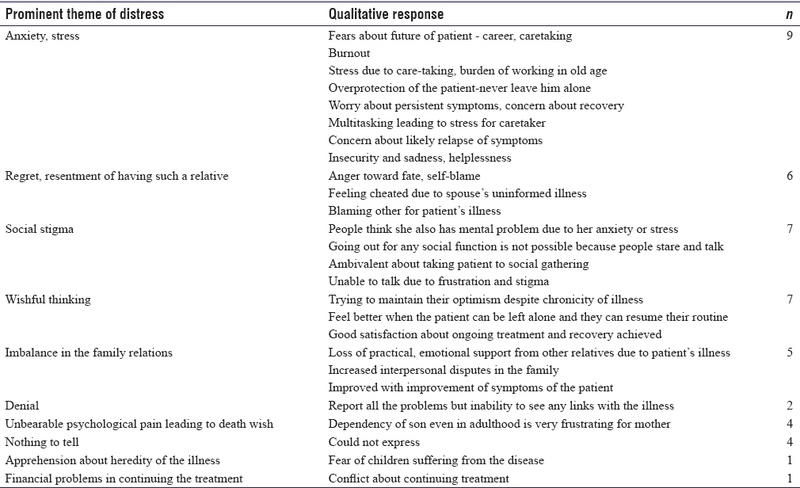 Summary of the qualitative responses given by caregivers to the 23-item questionnaire, especially designed for this study, is presented in this [Table 1]. Family burden may be influenced by the differences in mental health service provision, social network, and other cultural factors and it is important to recognize that this is a generalizing trend of family burden, and based on these reports, we can eventually implement programs to address the needs of caregivers of schizophrenia patients. The objective burden which includes effects on the household, including financial status, effects on the health of the children and family routine, and any abnormal behavior shown by the patient was common in these caregivers as in other studies.,, Compromised physical and mental health of the caregiver is seen in this study [Table 2] as well as reported in other recent Indian study. The subjective burden includes mental ill health and subjective distress among the family members., Many caregivers tend to perceive being blamed by their relatives and friends for being responsible for the patient's condition, leading to demoralization. The average age of the caregivers was between 51.21 and 53.3 years,, corresponding to 50 in our reference study and 44.7 ± 14.6 years in other Indian study, while 60% were females in our study as opposed to between 62.5% and 79%,,, in the other studies. Mother was the most common primary caregiver followed by father or a sibling. Various systemic illnesses such as diabetes mellitus, hypertension, and coronary artery disease often begin in this age group, and chronic stress is considered as a modifiable risk factor in these illnesses. As clinical condition of the patients varies, adjusting to their caretaking is a dynamic process. Interpersonal problems in the family were reported by relatives. They were more common when the illness was active and patient more symptomatic. Some caretakers were also perceived to be psychiatric patients by their relatives. Whereas financial constraints were the major cause of worry for caregivers, we found that it was the large amount of time spent in caregiving that affected them.,, The caregivers had to borrow money and often use unscrupulous means to make ends meet. One patient could not afford cost of treatment and had stopped taking medications. Nearly 13.33% of the relatives had insufficient knowledge and needed appropriate psychoeducation about patient's illness, and about 6.67% admitted to needing medical attention themselves. One of them also reported of having suicidal thoughts and was offered psychiatric intervention. Similar study in Indian setting has reported the need for holistic care of these caretakers and psychiatrists should be aware of their genuine distress and psychosocial needs as well. On the brighter side, 30% of the relatives expressed hope for the patients' recovery and confidence in their own caregiving. Based on this study, enhancing positive emotional support from friends and relatives is important for well-being of the caregivers. Creating awareness in the society and psychoeducation of relatives would help in enhancing such support. Health of the caregivers should be taken care of. Psychiatrist should advise them regular health checkups as they are facing this extraordinary stress. Caregivers' mental health can be maintained by regular ventilation, support, and counseling. Psychiatric intervention can be advised if required. Information about various rehabilitation options, vocational guidance will also be helpful. This needs to be an integral part of the management of schizophrenia. Expressed emotion in caretakers is reliable predictor of relapse in schizophrenia. Reducing expressed emotion may be possible if the caregivers do not alienate themselves from the society and their friends and maintain their own mental health. When did you notice a difference in behavior of the patient? What did you do in that scenario? Have you and your family been looked upon with any kind of social stigma? Has your family been blamed for your illness? Have you been considered to have a similar disorder? Has this caused a change in your daily activities? Has this caused an obstruction in your career or in your social relations? Has this caused you to go through any associated illness like depression, hypertension, etc.? If yes, please mention below. Has there been a reversal of roles in your household? If yes, in what way? Has this caused any damage to your self-esteem? Have you faced any financial crisis? If yes, how are you managing it? Have there been any disputes in your family regarding the management of the patient's illness? Magliano L, Fiorillo A, De Rosa C, Malangone C, Maj M; National Mental Health Project Working Group. Family burden in long-term diseases: A comparative study in schizophrenia vs. physical disorders. Soc Sci Med 2005;61:313-22. Panayiotopoulos C, Pavlakis A, Apostolou M. Family burden of schizophrenic patients and the welfare system; the case of Cyprus. Int J Ment Health Syst 2013;7:13. Reine G, Lancon C, Simeoni MC, Duplan S, Auquier P. Caregiver burden in relatives of persons with schizophrenia: An overview of measure instruments. Encephale 2003;29:137-47. Attepe Özden S, Tuncay T. The experiences of Turkish families caring for individuals with schizophrenia: A qualitative inquiry. Int J Soc Psychiatry 2018;20764018779090. [Epub ahead of print]. Rodrigo C, Fernando T, Rajapakse S, De Silva V, Hanwella R. Caregiver strain and symptoms of depression among principal caregivers of patients with schizophrenia and bipolar affective disorder in Sri Lanka. Int J Ment Health Syst 2013;7:2. Caqueo-Urízar A, Gutiérrez-Maldonado J, Miranda-Castillo C. Quality of life in caregivers of patients with schizophrenia: A literature review. Health Qual Life Outcomes 2009;7:84. Raj EA, Shiri S, Jangam KV. Subjective burden, psychological distress, and perceived social support among caregivers of persons with schizophrenia. Indian J Soc Psychiatry 2016;32:42. Ganesh K, Gupta S. Comparison of unmet needs of patients on treatment of schizophrenia perceived by patients and their family caregivers. Indian J Soc Psychiatry 2017;33:181. Mandal P, Prakash S, Sagar R. Primary caregivers of schizophrenia outpatients: Burden and its correlates. Delhi Psychiatry J 2014;17:343-8. Adeosun II. Correlates of caregiver burden among family members of patients with schizophrenia in Lagos, Nigeria. Schizophr Res Treatment 2013;2013:353809. Gupta A, Solanki RK, Koolwal GD, Gehlot S. Psychological well-being and burden in caregivers of patients with schizophrenia. Int J Med Sci Public Health 2015;4:70-6. Lippi G. Schizophrenia in a member of the family: Burden, expressed emotion and addressing the needs of the whole family. S Afr J Psychiatry 2016;22:1-7. Gater A, Rofail D, Tolley C, Marshall C, Abetz-Webb L, Zarit SH, et al. ”Sometimes it's difficult to have a normal life”: Results from a qualitative study exploring caregiver burden in schizophrenia. Schizophr Res Treatment 2014;2014:368215. Koschorke M, Padmavati R, Kumar S, Cohen A, Weiss HA, Chatterjee S, et al. Experiences of stigma and discrimination faced by family caregivers of people with schizophrenia in India. Soc Sci Med 2017;178:66-77. Shamsaei F, Cheraghi F, Bashirian S. Burden on family caregivers caring for patients with schizophrenia. Iran J Psychiatry 2015;10:239-45. Brotman DJ, Golden SH, Wittstein IS. The cardiovascular toll of stress. Lancet 2007;370:1089-100. Muscroft J, Bowl R. The impact of depression on caregivers and other family members: Implications for professional support. Couns Psychol Q 2000;13:117-34. Geriani D, Savithry KS, Shivakumar S, Kanchan T. Burden of care on caregivers of schizophrenia patients: A correlation to personality and coping. J Clin Diagn Res 2015;9:VC01-4. Ong HC, Ibrahim N, Wahab S. Psychological distress, perceived stigma, and coping among caregivers of patients with schizophrenia. Psychol Res Behav Manag 2016;9:211-8. Patel V, Saxena S. Transforming lives, enhancing communities – Innovations in global mental health. N Engl J Med 2014;370:498-501. Butzlaff RL, Hooley JM. Expressed emotion and psychiatric relapse: A meta-analysis. Arch Gen Psychiatry 1998;55:547-52.